“Why is it still dark outside? Who are these hungover people sleeping in my room? In fact, I was glad she was there. 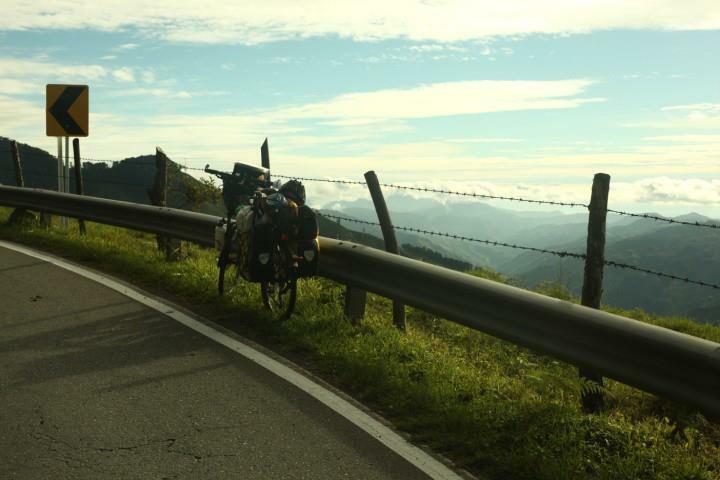 Nobody else was awake to see me squeeze my panniers through the too-small set of doors. Kiss, kiss. Gone. It had all started with a hot shower. As it rains every five minutes in the municipality of Bogotá, I had expected this would soon turn into a cold shower but I was more concerned with the prospect of being knocked down by a bus before I’d even left the city. Even at 6.45am, La Candelaria was heaving with traffic and my route out of town, Calle 13, stretched out in front of me amongst a sea of grey blocks. Fortunately, I’m not superstitious, well not in the way people who see ghosts are, so the significance of the street number was lost on me. If you take the cable car to the top of Monserrate, the mountain which rises to about 3,150m to the east of the city, Bogotá appears flat as it stretches out to the north west. Once you get on a bicycle, though, you realise that it actually slopes downhill from south east to north west and, barely pedalling, gravity was pushing me along at almost 30km/h across the high plains of Cundinamarca. “This is easy!” I laughed to myself. “¡Buena suerte!” he called as the lights turned green. You can see the north-western lip of the Cundinamarca plain from Bogotá and it wasn’t long before I was climbing. Now I could feel the weight of by bicycle and everything I had loaded on it. I tripped down into the lowest gear and began the first uphill grind of my journey. I had barely thought about eating since breakfast but better late than never. I stuffed a lump of chocolate and some biscuits in mouth and washed it down with water. The horizon of the Cordillera Oriental sank slowly before me until, just beyond Facatativá, I was finally able to look out towards the even greater Cordillera Central that I would soon be crossing. I ate some more chocolate and let the thought of it leave my mind to concentrate on the long descent in front of me. The aim that day was to reach either Villeta, at around 120km, or Guaduas, at around 140km. Luis, a local who had stopped to chat and take a photo for me, informed me that there was an 18km climb after Villeta but that I should have no trouble. I paused my descent soon after our meeting for a lunch of bread, chorizo and cheese followed by an apple and more biscuits and chocolate. The descent into Villeta was long and brought me down through Albán and Sasaima to the much more humid temperatures of Cundinamarca’s valleys. Suddenly I was surrounded by a huge variety of insects and butterflies decorated with bright colours. I had to stop at one point to avoid hitting what I initially thought was an animal in the road. However, at about 5 inches long, black with a red shine on its back and exhibiting long antennas swooping back from its head, it could only have been one of the giant long-horned beetles native to South America! With the air rushing past me at 30-40km/h I was glad to be descending in this heat. By the time I reached Villeta at an altitude of around 800m the temperature was soaring. I suppose I didn’t realise how tired I was because I tore through the town and attacked the 18km climb that I’d been warned about like a raging Marco Pantani on the Col du Galibier. This was a huge mistake. Already tired from the previous 120km and lack of sleep the night before, I was exhausted after only a few kilometres. Suddenly I felt like Jan Ullrich, Pantani’s defeated opponent in the Alps, confused, overweight and without any friends. As I stopped to catch my breath and rest my legs I felt as though I’d truly overestimated the amount of weight I could carry over these mountains. Rather than crack, like Ullrich, I gritted my teeth and tried to hold a steady 6km/h, determined to see the summit by the end of the day. 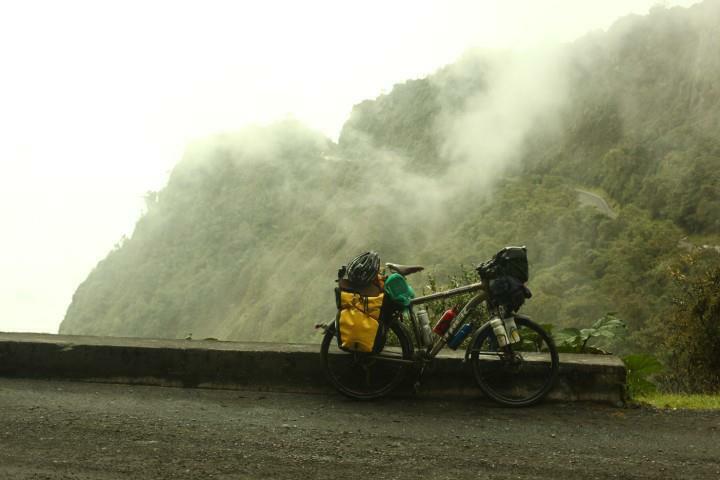 This was my first real taste of an Andean climb and, although not actually any higher or more difficult than climbs I’ve done in Europe on my racing bike, it dragged on and on because of the weight I had to carry. Nearer the top, as my legs turned to jelly, I was forced to stop almost every 500m for a rest. At least this gave me a chance to look around and chat to the locals. I had left Villeta at 12:30pm and didn’t reach the summit until four hours later! I was ecstatic to have conquered my first climb of the trip and lingered for a while to enjoy the view. There was little more to do other than cruise down the back of the mountain to Guaduas, where I greeted the people with a wide but probably rather stupid-looking grin on my face. That soon changed in centre of town where, unable to stand up on my bike, the cobbled streets finished off my arse for the day. I didn’t want to spend long looking for a place to stay. I needed a bed, that much I was sure of, so I decided to spend most of my daily budget – which is, incidentally, 20,000 pesos or slightly less than £7 – on a hotel room. The San Cristobal Hotel was an inviting family-run place situated only a few hundred metres from the picture-postcard town plaza. They let me cook my dinner in the courtyard and, like everyone, seemed particularly interested in my multi-fuel stove! Naturally, sleep came soon after the sun had set. After being in the saddle for over 10 hours the day before, dragging myself out of bed this morning was never going to be easy. Like the day before my alarm thumped away eagerly, this time a couple of hours later at 7am. I hit “Snooze” as soon as I could and went back to sleep, glad of the wooden shutters on my windows blocking out all but the narrowest sliver of daybreak. I managed to rouse myself eventually just before 8am and set about making breakfast. Despite having eaten a massive portion of spaghetti within recent hours my stomach cried out for more sustenance. Oats made with powdered milk, apple and cinnamon met the challenge, washed down with coffee, of course. If you speak to a nutritionist about porridge they’ll probably babble on with, “Oats are extremely high in complex carbohydrates and soluble fibre meaning they release energy slowly helping sustain concentration throughout the day.” Unless, of course, the nutritionist in question is being quoted in the Daily Mail, in which case oats give you cancer. However, I like them because they remind me of being a child at home and my mum making me Ready Break before school. Although, there was one incident when I refused to take some disgusting rasberry-flavoured medicine and she mixed it with the Ready Brek in a vain effort to trick me into taking it. To this day I still cannot stand the flavour of raspberries. Anyway, all of this goes to proove the psychological effect of food is equally as important as the physical. Feeling a little heavy from breakfast I packed slowly and when I finally emerged onto the street it was raining. Guaduas is caught in a valley so I imagined brief rain showers being quite typical there and I hesitated a moment, chatting with the hotel owner. Impatience got the better of me after a few minutes and I set off down the cobbled street under the weather. I’m not exactly a fair-weather cyclist back in the UK and, on a weekend ride out of the city into the hills of London’s Home Counties, a bit of drizzle is the least you can expect! As I was beginning to get used to, a day of cycling in Colombia almost always begins at the bottom of a hill. Today being no exception I set my pace and began another slow grind to whatever the next summit was going to be. By that hour of the morning the temperature was already high and I was glad of the rain after a few kilometres. One of the difficulties of cycling in this area is the near constant fluctuation in climate and temperature as you climb and descend sometimes four or five times per day. After eight days in Bogotá my body had grown accustomed to the thinner and cooler air and now I was almost 2000m lower in a valley where the air was thick and humid. A few hours later I would be nearer 1500m again! About an hour out of town I spotted some vultures in the road ahead. They paused pecking at the woven nylon bag they had surrounded to peer sinisterly in my direction. Normally used to carry grain or rice, it appeared this bag contained a dead dog and the scavenging birds were busy pulling the entrails out of its backside. In Colombia’s countryside there seem to be as many dogs as there are people. Many that I’ve encountered are allowed to roam freely in the road and, when they’re not breeding, love to chase cyclists! Nonetheless, I wondered how this dog had come to deserve such an ugly demise. Continuing uphill I was passed in the opposite direction by many local cyclists who whistled and shouted words of encouragement. I stopped to chat with some of them who were sampling the freshly-squeezed juices you’re able to buy from stalls dotted along the roadside. Of course, they were keen to know where I’d come from and where I was going and also to wish me luck. When you’re exhausted from the climb sometimes all you need is the energy of a passing stranger’s wave or whistle to keep you going. It reminds me of standing on the side of Mont Ventoux to watch the Tour de France pass by. By the time the riders reach the foot of the ascent they have already covered almost 200km and faced four categorised climbs. The people there to see them line the narrow, winding road in their thousands, leaving a channel at times only a few feet wide through which the riders must pass. There were nearly half a million people on the mountain that day and, after several hours of waiting, they erupted in a 22km wave of hysterical jubilation moving up the mountain at the speed of their nearly-defeated heroes. Anyway, I digress… back to Colombia! My new friends told me that I had another 9km of climbing to do before the road flattened off, ascended a little more before finally descending into Honda along the Río Magdalena, Colombia’s longest river at over 1500km. Buoyed by their excitement about my trip I made the summit quite easily and began to relax. As I rounded a bend I scared a chicken out of a bush which then got hit by a truck as it tried to cross to the other side of the road. Three teenage girls standing on the verge screamed as the chicken somehow managed to emerge slighly battered but still running from the underside of the truck! The state of the road after this point became markedly worse with landslides covering at least one lane and pylons standing half broken alongside. I began to see men and equipment working in the road who told me I would have problems ahead. I passed a police motorcyclist who made a kind of “Where do you think you’re going?” gesture with his face and hands. Lo and behold I came across my first real logistical problem. The road ahead of me turned into a sea of mud, trees and collapsed houses. There were a few people around but only on foot so I asked them what was happening ahead. They said a landslide had taken the road out for around 2km and I would need a guide to show me the way across. Initially, I suspected they were having me on but, after questioning a couple of people travelling the other way, realised I was being told the truth. They looked at me like I was crazy when I asked if it would be possible to push my bike across. I was stuck with a dilemma. I didn’t believe I needed a guide but, by myself, it would take at least three trips back and forth to carry everything on my back and it would mean risking some of my things, including my bike, at either end of the 2km pass. The only option was to carry everything at once but that would require two people to help me. The great thing about Colombia is that if there is a job that needs doing, there’s always someone on hand to do it and, after a bit of haggling, for a reasonable price. 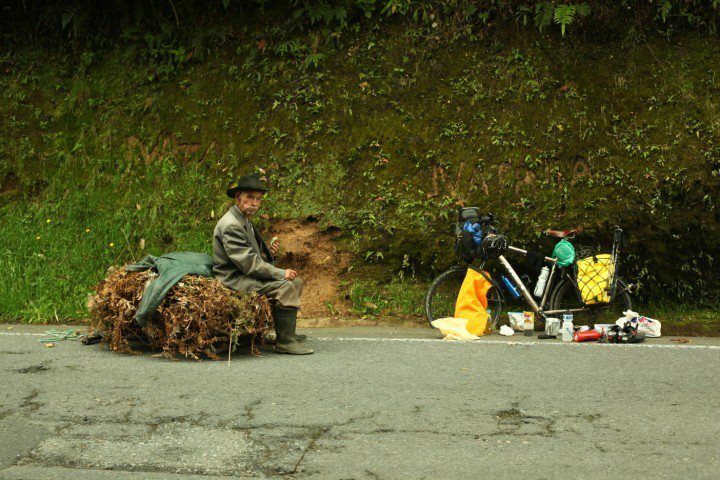 For 5000 pesos each, César put my bike on his back and Ignacio took my panniers. I carried everything else in my small rucksack and took photos. Well, someone had to! It wasn’t long before the extent of the damage became apparent. The road wasn’t just blocked, it had disappeared! Although the broken remnants of road signs and tarmac remained in some places, for the most part, it had been replaced by mud… lots of mud. Negotiating the gap we had to walk through somebody’s farm and descend a steep slope to around 100m below where the road had been. We then had to climb another very steep slope to reach where the tarmac started again. Now I understood why I had been taken for crazy when I asked if it were possible to push my bike through this mess! Having safely arrived on the other side I packed my bike while a group of locals crowded around asking the usual questions about my trip and admiring my things. Although my things were spread out, I keep important items that I don’t want to lose either in my panniers or on my person. Though it would theoretically have been quite easy for someone to slip away surreptitiously with my frying pan, which I keep strapped to the top of one of the panniers, walking away with the pannier itself unnoticed would be pretty difficult. My “guides” were kind enough to hang around until I had everything packed up although César was keen to get back to help any more unsuspecting cyclists that should come along that day. Ignacio hung around for a little longer and we shared a Jumbo chocolate and peanut bar and some water. With the assurance that there were no more impassable landslides ahead I made my way downhill to Honda. Having left Guaduas late and lost time to the landslides, I arrived at the lowest point in my route at the hottest time of day. Honda lies on the Rio Magdalena at less than 200m above sea level. As I crossed the bridge into town the river raged beneath me, swelled by the country’s largest rainfall on record, its mood matched by the colour of the thick reddy-brown sediment it was shifting. Despite knowing there would be a climb out of town it was too hot to hang around. I had also spent half my daily budget crossing the landslide so needed to continue to somewhere I could camp for the night. The direction of Mariquita – which in Spain means “sissy” if I remember correctly – took me on a gradual but painfully long uphill stretch. Under the afternoon sun I felt well out of my comfort zone. A boy came and rode next to me for a few kilometres. I shared my water and he suggested I come and stay at his parents’ camping ground. In hindsight, this probably would have been a good option but, having only covered 30km, I thanked him and continued onwards to Mariquita. The afternoon wore on incredibly slowly. I stopped at a pay station to ask for water how far away Mariquita was. Initially, the man had said ten minutes which then became twenty and finally thirty after I gave him a disbelieving look. I knew it was going to take at least an hour and it did. As I drew closer to the town I began looking for a place to sleep. A couple of kilometres before Mariquita I turned down a dirt track in the hope of finding somewhere secluded to rest. I knew from the map there was a river somewhere in this direction but I wasn’t sure how far it was from the main road. The heat of the day was abating and I was enjoying rolling at a gentle pace between the fields as the birds began to sing in the late afternoon light. I felt a great sense of peace during those moments knowing I didn’t have to be anywhere in particular. After a few kilometres a man passed me on a bicycle. It turned out the river was a bit further than I thought and, since the state of the road was quickly declining, I decided to turn back. On the way back I learnt one of my first lessons about riding a bicycle with 40kg of weight on the back. On the way down there had been one point in the road where I’d had to get off and walk. I thought, since I was going uphill now, I should be able to ride it. However, getting the rear wheel the wrong side of a rock, the bike lurched violently to one side. I managed to put my foot down but couldn’t help the bike from falling heavily to the ground. “¡Que cayó!” shouted a boy who was approaching, as I struggled to pick up the bike. This had been the first time I’d dropped her and I wasn’t expecting how difficult she would be to get upright again. I had seen a place on the way down the track which I thought was suitable to sleep. It was a small pagoda-like building at the entrance to a farm. The farm gates were locked and there didn’t appear to be anyone around so I decided I’d sleep under the eaves on the side facing away from the track. There was a fence all the way around except for the entrance. I found some sheet metal that I placed flat on the ground either side of me. The idea was that if somebody should approach their footsteps would make a lot of noise and I would be woken. It turned out to be very effective except that the only beings interested in me were dogs hungry for what I had in my food bag. I decided my panniers and handlebar bag which contains my camera would be safer kept on the bike. I balance a frying pan and lid precariously on the handlebars hidden underneath the clothes that I’d been wearing for the previous two days cycling. I imagined that if someone were brave enough lift up my stinking socks they would probably do it in a hurry and upset the balance of the frying pan, whereupon it would fall to the ground with an enormous clatter and wake me up. What exactly I planned to do at that point, I have no idea! I made myself more spaghetti for dinner and, with the darkness quickly arriving I drifted slowly off to sleep under a blanket of stars with the sounds of Colombia’s national sport, tejo, being played in the distance. Today I faced the most challenging day of my assault on Colombia’s Cordillera Central. From Padua the road climbs almost 2000m higher to Alto de Letras which, at around 3800m, was the highest point I would reach in these mountains. The distance between Padua and Letras is around 40km which is followed by a mammoth but very welcome 28km descent into Manizales. I decided that if I could reach Letras by 5pm I would be safely down in the city, preferably taking a hot shower and eating some kind of enormous pasta-based dish, before nightfall. The previous day I had spent almost 12 hours climbing only 52km so I knew I’d have to be on the road early to stand any chance of reaching Manizales in time. Naturally, I woke up a little late at 7am. I quickly packed my bike, bought a couple of large Jumbo chocolate bars and was off. That wasn’t too hard but I knew the rest was going to hurt. I could cycle 100km every day for a week over the small undulating hillocks of England but here was different. I needed rest and I hadn’t had any for a while. I hadn’t had any breakfast either so I stopped in town to buy gingerbread and a tinto (black coffee) from the bakery. There was an ominous-looking barrier blocking the road on which I was meant to be cycling that said it would close at 3pm. I wondered what would happen after this time. Perhaps this area was a bit like the Bermuda triangle. 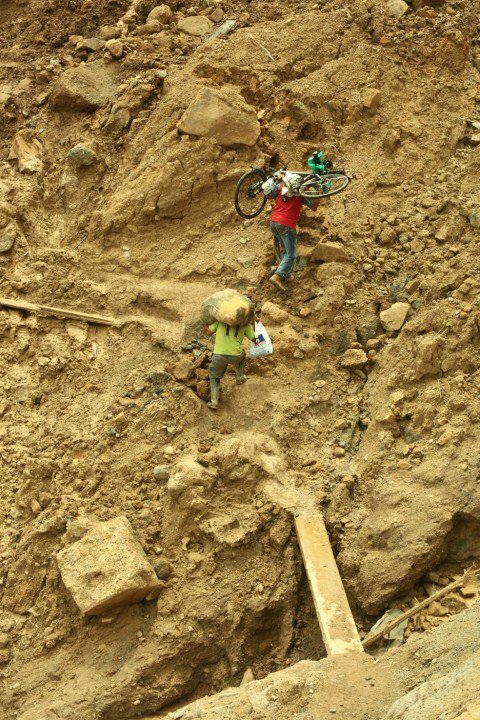 One minute you’re there, the next a landslide buries you under a heap of mud and you’re never to be seen again. The least I could hope for was a little less traffic after this time. You’d be surprised how many vehicles trundled past me on these high mountain roads. There would be at least one lorry or motorcycle per minute and the occasional car or pick-up truck. There being only a relatively small rail network in Colombia most goods are transported by truck and keeping the roads open in spite of the weather is extremely important for interdepartmental trade and communication between cities. Given that a large number of these roads are undergoing constant renovation to counter the effects of the ever-shifting landscape, I suppose a larger rail network would be quite an engineering challenge. At this altitude I could remain cool as the morning sun shone brightly above. This is what I had come here for: the clear mountain air, the opportunity to marvel from above the clouds at the plunging landscapes below me. More than that, though, since being in Colombia what has overwhelmed me more than anything else about this country is the warmth and generosity of its people. A motorcyclist who had slowed down to speak with me was waiting at a café a little further up the road. I wondered why he was waiting but he simply wanted to buy me a drink and something to eat. It seems around every corner are the welcoming arms of Colombian hospitality. I set myself a morning target of 25km, a little more than halfway to Letras and the climax of two days worth of climbing. At an average speed of 6km/h, less breaks every few kilometres or so, this took around five hours. During the morning’s climb I had seen an elderly gentleman dragging what looked like no more than a bundle of ferns up the road. The bundle, which was about one metre square and fifty centimetres high, was tied to a cart made of scrap bits of wood with rolling bearings for wheels. It made a racket as he dragged it up the mountain. As I sat to eat my lunch and make some coffee he caught me up and I offered him a sandwich and something to drink as he passed. He gladly accepted and sat down to rest on his fern bundle which looked much more comfortable than my seat in the gutter. I couldn’t understand a word he was saying through his toothless mouth but he seemed pretty satisfied and went on his way after about twenty minutes. I had reached almost 3000m and at that height the temperature was cold enough to cool me down very quickly. I didn’t want to spend too long out of the saddle with my muscles seizing up so I packed, stretched briefly and went on my way. By 2pm the gradient of the road had ratcheted up to the point where I was stopping at every milestone to recover myself sufficiently for the next kilometre. I calculated that I would still reach Letras by 5pm if I carried on at this pace and the quality of the road remained the same. A day or so before leaving Bogotá I had read in the news that part of this road had actually been closed for a while so, of course, things were never going to go smoothly. Above 3000m the road suddenly switched from a nice smooth tarmac to an uneven gravel. A little further on and I met the first of many workers who were employed fixing the damage the landslides had caused. I’ll stop to chat with anyone if it gives me the chance of a rest! They smiled broadly as I talked about my adventure. After some misunderstanding I established that I was no more than 4km from the summit. I breathed a sigh of relief and shared the rest of my chocolate with them in celebration. As I left, I thanked them for their work and they wished me luck for my journey. After around 4km I reached a summit but it wasn’t exactly the one I was aiming for. I could see the town of Letras at the other end of a ridge about 5km away but there was a significant dip in between. Could it be that I had I taken a wrong turn? Staring at the time on my cycle computer I panicked a little. It was 4.45pm which meant I had less than two hours until dark and it was getting cold. This had to be the correct road! Fortunately, my worries were alleviated as it curled around to the opposite side of the summit from where I could see it leading to Letras. However, after descending for around 2km I would still have to climb another 4km to reach the town. Why did I give away my last pieces of chocolate? Maybe my blood-sugar levels were low but it seemed very surreal to me that there should be hundreds of workers in the road up at this altitude. I remember most of them staring at me in bemusement but a few were kind enough to whistle or shout some words of encouragement. Forty-five minutes or so later I was still climbing and counting down the milestones as I went. It must have been the longest 4km of my life. I began looking longingly at the side of the road for somewhere to lie down and go to sleep. It sounds silly but among my cycling friends we refer to this condition as “bonking” or having “bonked”. It describes a situation where you’re physically and mentally capable of completing something but have no energy left in the tanks to fuel your brain and muscles. There’s one simple cause and that is NOT EATING ENOUGH. I was just about able to continue but at an incredibly slow pace. Letras is what you might describe as a one-horse town. By the time I got there at around 6pm everyone appeared to have left for the night. By this point the weather had become significantly less inviting and the temperature enough to give me a chill. I passed a well-barricaded police post that appeared to be waiting for the world to end. I had to get off the mountain before it did. It was still raining as I left Letras. I managed to buy two bags of crisps and a cake and ate the lot in about two minutes. A row of illuminated street lamps ceased at the edge of town and I was suddenly immersed in twilight. I shouted a few words to try and distract myself from the cold. The road was wet and so I had to check my speed at around 30km/h. Any faster and the wind chill was too much to bear anyway. I could see well enough for the first half of the descent but, as I got further into the valley and the shadow of the mountains, it became impossible to see the road in front of me, despite my head lamp doing its best. The road turned over and over as it wound its way down into Manizales, the loom of which I could see from up high. 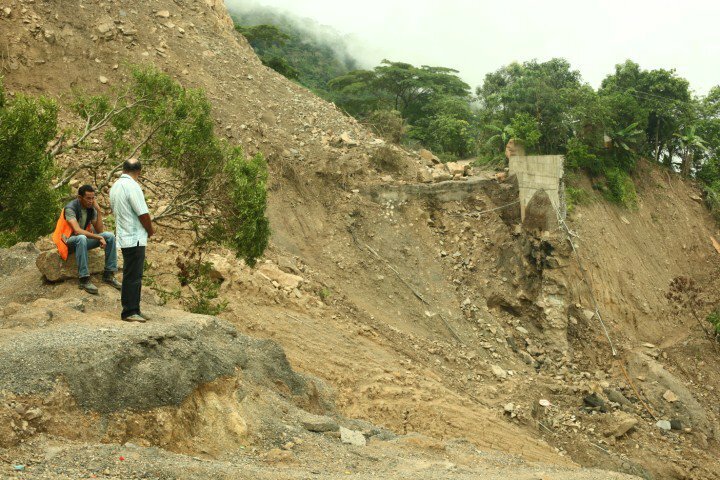 It seemed that many landslides had occurred in the final 10km leaving the road in a treacherous state. Hitting pothole after pothole I pressed on as best I could, hoping my aluminium rack would stand its first real test of the trip. This is epic! And no wonder you came back with the form you’re in! What an adventure. Is there another instalment? Who’s this ‘Catain’ who’s been posting comments?